We WON! 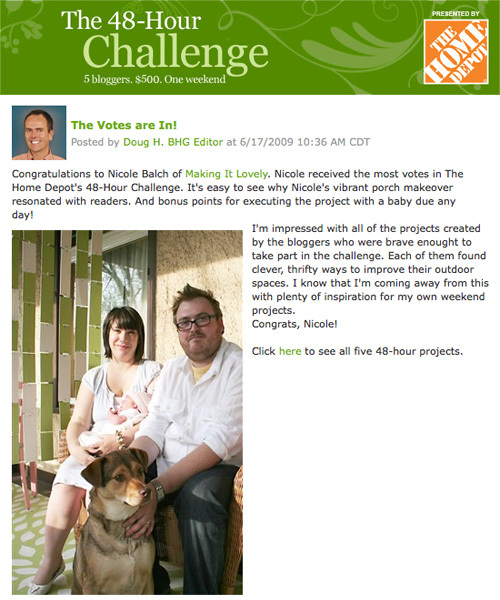 Making it Lovely received the most votes in the 48-Hour Challenge at BHG.com and we’ll be the recipient of a $5000 bonus! We’re so excited, and we’re eager to get started on a few new projects around the house that will now be possible. And obviously, we couldn’t have won without your tremendous support. Thank you, thank you, thank you. YAY! Your design was the best by far! Can’t wait to see you completed projects… so inspirational! I completely understand waiting until they contacted you, but congratulations! I am definitely keeping that hanging divider tutorial in my “ideas” book for when I get my house. Great idea! Congratulations! Your painted floor was and is definently a show stopper! :) So happy for you! Congrats! Glad you won – it was well deserved! Congrats. I have been voting daily. To do all that work while pregnant you deserve WAY more. All I could do while I was pregnant was make cheesecake and twinkies disappear. I LOVE what you did to your porch….and on a budget that we could all work with. Congrats! I really love the painted rug – it’s truly inspired and lovely. Can’t wait to see the new projects as you update us with their progress. You certain deserve the win and therefore, I committed to voting for you daily. Can’t wait to see what you will do with it! AWESOME! Congrats! It was very interesting to see how everyone used their money. You did a great job with the painted prorch, that really did it for me. Congratulations. So happy you won. You get double points for painting that porch at 9 months pregnant. I couldn’t even do up my shoes. Woooooooo! Congratulations! I voted for you. Congratulations!!! I’m so excited to see the money put to creative use. Well done! Now all you have to do is dance around singing “We got five thousand dollars. We got five thousand dollars.” Like Wayne and Garth. Congratulations! You did a great job on the porch. Congratultions! You really are the deserving winners. Congratulations!!! I really love the painted rug… I committed to voting for you daily. So happy you won. Congrats on winning! You did a wonderful job with it so it’s very well deserved! YAY! I voted daily and sent my friends and family emails and twitters to make sure that they voted for you too! That way you’d have some good old fashioned midwestern support! xoxo! YAY! congrats! you most definitely deserved it! Yayy!! Congratulations Nicole and Brandon!! Look forward for the upcoming project! Yeah Congrats! $5000 is a wonderful prize…that I am sure you will put to good use. Yahoo! You did a beautiful job on your porch! I’m so glad you won! Congratulations! I was hoping you would get it! You deserve it and I can’t wait to see what project is next. Congrats! They should give you an extra $1K for doing it while you were pregnant! Yay, congratulations! I voted for you almost every day and am so happy you won! Goodness Gracious GREAT BALLS OF FIRE – COURSE YOU DID – NOW will you be doing everything that you blogged about before? Congrats, Nicole! The win is well deserved and we couldn’t think of a better project or family to lose to. Can’t wait to see how you enjoy your dinero! Congrats Nicole. Im so happy you won! Well deserved. Cant wait to see more projects! Congratulations… I can’t wait to get started on my front porch! That’s awesome that you guys won! I love the painted rug. It pops and looks lovely. Hope to see the start of projects soon. Congrats! Now we can look forward to see more projects! Wow, congratulations! That is truly amazing and well deserved! I can’t wait to see what you do! Congratulations on a well-deserved win! Hopefully you’ll spend a little bit of that money on yourself. You certainly deserve a break. Looking forward to seeing any projects you may move forward on with the rest of it, though. Hooray for all four of you. yay! it was a nail biter! Hooray! You truly had the best design. Congrats! yay! congratulations! I can’t wait to see what you do with the money. All you projects turn out so wonderfully. AWESOME!! you soo deserved, your design was the best. Congrats,Nicole! I voted for you several times (although we were out of the country the last few weeks where internet connections were awfully sloooooow, so I missed a few chances.) In any event, I thought your design was the most creative and most difficult to execute. Can’t wait to see your next project! Congratulations! It’s well worth it because you made the space look amazing! I’m thrilled for you! I can hardly wait to see what comes next. Congratulations. I’ve been silently following the transformation and think that your porch is adorable. Congrats! Your projects will make great improvements in your home. I must say, though, you really worked miricles in that bathroom! Oh I am so happy for you!! I tried to vote as often as possible. i can’t wait to hear your ideas for the next projects! I knew you’d win! congratulations!!! Hip Hip Hooray! Well done! Congrats! I love reading the blog and look forward to lots of project updates after you spend some of that hard-earned cash! Congrats! you deserved it for doing this 9 months pregnant! and I can’t wait to see the results! It couldn’t have happened to a lovelier family! Congratulations!! That is awesome, yet totally unsurprising news. Your porch is so adorable, I was sure it would win! Congratulations!! Can’t wait to see your new projects! Congratulations! I can’t wait to see what you do with your winnings. You definitely deserved it! Congratulations! Yay congrats! You totally deserve it! FELICIDADES! So happy my daily voting paid off! :) Well Deserved!!!! Yay! I will give myself a little pat on the back for voting nearly every day! Congratulations! I voted for you on the days I remembered :) Looking forward to seeing what’s next on the home project front! i voted as much as i clicked to here and saw a reminder! congrats! it’s well deserved! Congratulations!! Well deserved. can’t wait to see what the new projects are! I’ve been checking daily for the results – so happy for you! I voted every day so glad it was all worth it! Can’t wait to see what you do! Yay!! I’m so glad all of that voting paid off. You really did have the best looking project. Congrats! You deserve it! I hope you have a blast putting the $$$ to good use! Congratulations1 Your porch is very cool. You absolutely deserve this and I can’t wait to see what you do with the bonus money. Keep us posted! I’m so glad you won! Much deserved! So excited that you won!! I love your porch – so gorgeous! You definitely had my votes. Congrats!